The first mainline steam engine to be built in Britain for 50 years is to feature in a TV race against a sports car and a motorbike. The £3m Tornado, built by enthusiasts in Darlington in an 18-year project, made its maiden trip last year. The loco will be shown on BBC's Top Gear programme racing a Jaguar XK120 car and a Vincent Black Shadow motorbike from London to Edinburgh. The race took place on 25 April, and the result will be shown on Sunday. Presenter Jeremy Clarkson mans the Tornado's footplate while James May takes to the wheel of the Jaguar and Richard Hammond sits astride the motorbike. 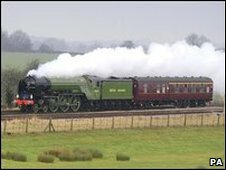 Tornado, which sets off from London's Kings Cross station and stops off at Grantham, York, Newcastle and Berwick during the race, has entered regular service on excursion trains on the Network Rail main line.